Two Chicks On Books: Blog Tour- FULL FUSION by NJ Damschroder Favorite Scenes & A Giveaway! Blog Tour- FULL FUSION by NJ Damschroder Favorite Scenes & A Giveaway! Hey everyone! I am thrilled to be hosting a spot on the blog tour for FULL FUSION by NJ Damschroder! I have NJ's favorite scenes to share with you today! And make sure to enter the giveaway below! Haven't heard of FULL FUSION? Check it out! Top 5 favorite scenes and why. 1. Any scene with the twins in it. Roxie has two five-year-old twin sisters. They are savvy little minxes, knowing just how to play the right level of cuteness to wrap Roxie and her friends around their little fingers. And they’re a huge reason Roxie continues to fight when things get darkest. 2. The scene when Lincoln tells Roxie that she’s half angel. This is the big revelation that makes her life make sense and sends her on the big journey across all three books. Also, he’s in her room and not supposed to be, and her mother comes in and makes everything very tricky. I never had to hide a guy behind my door when I was in high school, but if I had, the scene would have been very much like the one in the book. Roxie’s mom is a lot like my mom was. She died before I wrote this book, but I like to think she wouldn’t mind the parallels. Roxie is on this quest to find her soul with the help of her best friend Jordan, her boyfriend Tucker, and their friend Lincoln, who is also half angel. They’re the kinds of friends who will, you know, duck out on the senior trip to help you save the world. But they’re also human, and the fight comes as a huge surprise, leaving Roxie alone and feeling ripped apart even more than she had been when her soul was taken. How can this be one of my favorite scenes? Because I know the reconciliation is coming! Roxie battles through the whole book with the decision whether or not to fuse with her soul once she gets it back. The light is like a concentrated power source, and someone has been using it to do bad things. She’s afraid that it’s tainted, and fusing with it will change her in bad ways. But it’s a missing part of her, so of course she wants to be whole. In the end, she doesn’t have time to agonize over the decision, and love is the only driving force in what happens. After Roxie saves the world (spoiler alert! [except not really, I only write happy endings! ]), her challenges aren’t over. Lincoln is in mortal danger, and Roxie needs him. She can’t face her new reality without someone’s help. I really love how she faces the challenge of her new powers seconds after receiving them. 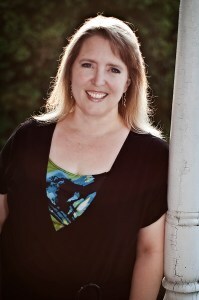 Natalie J. Damschroder is an award-winning author of contemporary and paranormal romance, with an emphasis on romantic adventure. She has had 24 novels, 7 novellas, and 16 short stories published by several publishers, most recently with Soul Mate Publishing, Entangled Publishing, and Carina Press. She recently debuted her Fusion Series, a young adult paranormal adventure series, with Full Fusion, as NJ Damschroder. Learn more about those books here. 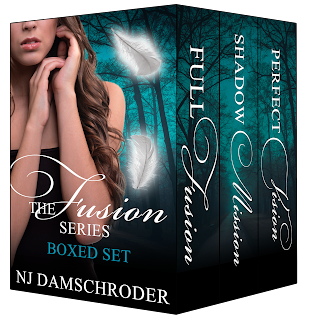 3 winners will receive a Box Set of the FULL FUSION Series, US Only. Ends on March 27th at Midnight EST! This series sounds magical ans exciting. On my TBR. This sounds like a really exciting series. Thanks, Danielle and Penny! Good luck!